This novel is based on an actual 1885 expedition by Lieutenant Henry T. Allen. Eowyn Ivey’s character, Colonel Allen Forrester, travels up the Wolverine River with a small band of men (and soon, one woman and one dog) into the vast untamed Alaska Territory. There are three simultaneous story lines. Forrester’s journals create the main story line. He writes of the Alaska expedition, complete with cold, ice, encounters with native peoples, near starvation -- all the challenges you would expect. His wife Sophie, a feminist who has been left behind in Oregon, also keeps a journal, which makes the second story line. The third story emerges from the delightful current day letters between one of Forrester’s descendants, Walt, and a museum curator, Josh, in Alaska. In addition, there are period photographs, drawings and diagrams sprinkled throughout the book. I wondered what magical realism might appear, given Ivey’s predilection towards it in her first novel, The Snow Child. 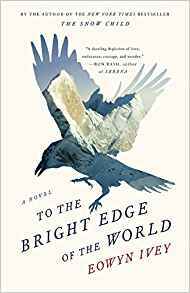 And there is a rich theme of magic in To the Bright Edge of the World that shows up in the Old Man, a raven, the woman Nat’aaggi, and various events, which would prove to be spoilers if I told you about them! My friend Mary suggested this novel as a preparatory read before I travel to Alaska later this month. An excellent choice! It isn’t dry history, but it did imbue me with a sense of the vastness and the hardships of Alaska, brought alive by Ivey’s fine imagination. If you read it, please weigh in on who you think is the author of the infrequent journal entries that begin with latitude, longitude and the weather (page 84 and 207 are but two examples of these.) One person I know thinks these writings belong to Pruitt, one of the men on the expedition. I think it is the Old Man and the raven, who I believe are one and the same. Or are they reports from Nat’aaggi? Who do YOU think it is? Glad you liked this, Andrea. It was 4 hearts for me also. For all the same reasons you gave.